I am beyond excited about my manicure this week. I went to Haven today for the Citrus Manicure and Pedicure (more on that in an upcoming post), and I decided to bring along my new M.A.C Alice + Olivia Nail Lacquers. 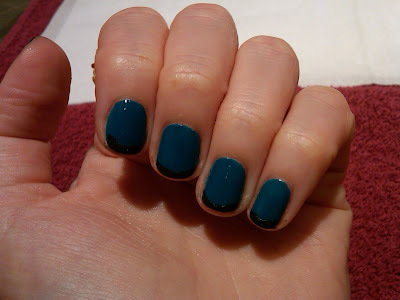 While I am totally not a fan of the normal French manicure, I really wanted to try one with Morning.After and Military. And you know what? I am thrilled with the result. (Seen above: Morning.After on the nail, Military on the tip.) Check out more pictures after the jump! Morning.After is the perfect blend of teal and turquoise -- and it's so, so gorgeously rich and creamy. Military is actually a matte silvery black, but with a coat of Seche Vite it's undeniably glossy. My manicurist, Fahmida, checking her handiwork. Doesn't the manicure just make my Alexis Bittar Large Gold Calder Coral Ring just sing? Each of the M.A.C Alice + Olivia Nail Lacquers retails for $12. Disclosure: The nail polishes were furnished by a PR representative for M.A.C. The manicure was provided free of charge for editorial consideration.